"I have looked in-depth at today's self-absorbed leadership. It is not interested in you, and not in us. Believe me, I am very proud of our country and will never be ashamed of it. But lately more and more people, both right and left, myself included, are deeply embarrassed by the way our leadership conducts itself. A strong government governs to unite and doesn’t govern in order to separate, to rule." *Candidate for Prime Minister, the former chief of staff, Benny Gantz, broke his silence and gave what commentators considered a sharp, stately charismatic speech, which some said could bring him the votes to oust Israeli Prime Minister Binyamin Netanyahu. (See Commentary/Analysis below.) The speech, which Haaretz translated to English, shared his platform, which was not left-wing, but not terribly hawkish. The word stately was used repeatedly by commentators to describe it. Gantz said there is no way Netanyahu can be prime minister if he is indicted, he slammed the present ‘divisive’ government, he said he opposed incitement against the law enforcement authorities, the judicial system, the cultural establishment and the media, he would strive for peace with the Palestinians, but also keep settlement blocs, he would allow humanitarian aid to Gaza and he would allow limited public transportation in the country. He said a government headed by him would offer Israelis unity and equality. He was slammed by right-wing politicians, who called him a ‘clear leftist.’ Netanyahu called him ‘another (Yair) Lapid.’ Minister Naftali Bennett said he was a danger to security. And even an MK from the left-wing Meretz called him 'the Seinfeld of politics.’ Before his speech Gantz officially joined forces with Moshe Yaalon, another former chief of staff and ex-defense minister. And Gantz was praised by former U.S. general Martin Dempsey who said Gantz’s long silence was a sign of his confidence. Yedioth’s Itamar Eichner reported that Netanyahu is planning a 'diplomatic blitz' before the elections, including visits to India, the US, Morocco and possibly even Bahrain, as well as to host Brazil's president in Israel, in an effort to highlight his warn ties with world leaders. Haaretz+ reported that according to the latest polls and assuming that Gantz won’t join a Netanyahu government, it’s possible Netanyahu won’t be able to form a new government. It turns out that Gesher, the new party of MK Orli Levi-Abekasis, may be the kingmaker. Also in election news, a retired general under investigation for corruption, wants to be the next Public Security minister. And, Twitter has begun suspending accounts that spread fake news to Israelis ahead of the April 9th election. No, Netanyahu, Gantz Is Not Left-wing – He's the Old Right (Noa Landau, Haaretz+) What distinguishes his platform from today's right are a return to statesmanship, narrowing social rifts, fighting corruption and protecting state institutions. Gantz's next mission: Teaming up with Ashkenazi or Levy-Abekasis (Yuval Karni, Ynet) In the day after his big campaign launch speech, Benny Gantz is hard at work to make additional political moves that could bring him up to par with Netanyahu in the race for the premiership. Gantz's Message: Vote for Me – I'm Meaner Than Netanyahu, but Clean (Anshel Pfeffer, Haaretz+) Benny Gantz's delivery shows he is still less comfortable in a suit than in combat fatigues, but that's what his team wants him to convey. It’s not a mistake, it’s a policy: we deserve a different medical system (MK Itzik Shmuli, Maariv) Criminal malpractice, mismanagement, and chronic under-budgeting which has starved the public health system to the point of collapse, along with the criminal act of inflating the private system through complementary insurance. In Maiden Political Speech, Gantz Sounded Clearer and Sharper Than When He Was IDF Chief of Staff (Amos Harel, Haaretz+) Gantz's main drawing card is still his military background. That's why Netanyahu feels under such pressure from his candidacy. Gantz will learn very quickly that, following the sharp looks, they will stab him with sharp knives (Ben Caspit, Maariv) The former chief of staff tried in his speech to enjoy the best of both worlds: He will rehabilitate the health system and restore its former glory. He successfully passed his first true baptism of fire. Gantz finally speaks, but doesn't say much (Mati Tuchfeld, Israel Hayom) Meanwhile, the Left's and the Right's attacks against the former IDF chief indicate that other candidates view him as a viable threat. If Benny Gantz winds up facing off against PM Netanyahu, the Israel Resilience party will become a magnet for votes. With Campaign Launch Speech, Gantz Reinforces Sense That He Could Succeed Netanyahu (Aluf Benn, Haaretz+) For the first time in a decade, the opposition has someone with authority and military experience, and Gantz's speech showed he can lead the anti-Netanyahu camp. Now there is an alternative (Arik Henig, Maariv) You cannot harm a person like Gantz, whose image has been shaped over years, as someone who was born in a moshav, a pupil at a religious school and a paratrooper in his soul, who reached the summit of the paratroopers and then the summit of the IDF. ..Gantz's entry into politics severely harmed his opponents. Starting from Bibi - who was also harmed by (Attorney General) Mendelblitt - including Bennett and Gabbay and Lapid. Now Gantz is at a junction. The big question is can the momentum of yesterday become a pull of the people, especially the center, and also from the other parties, and if others continue to attack him will that only give him more mandates?...Anyone who understands things knows that after Rabin and Barak it's clear that only a (former) chief of staff can bring the redemption to the left-center bloc. Now there are two of those - Yaalon and Gantz - on the same list, which appears to be an excellent one and includes security, education and municipal people. The question is will all that be enough on the night of the elections. For the First Time in Years, It Looks Like Israel Has an Alternative to Netanyahu (Ravit Hecht, Haaretz+) Benny Gantz’s speech Tuesday was riddled with clichés, but the promise of statesmanship that the leader of the new Hosen L’Yisrael party is selling to the public will find takers. More empty slogans (Dr. Haim Shine, Israel Hayom) Rather than showing the modesty befitting a political newcomer, Benny Gantz is trying to pull voters from the Left and the Right without clearly stating his positions and qualifications. An Alternative to Netanyahu (Haaretz Editorial) Let us hope that the heads of the Labor Party and of Yesh Atid will swallow their pride and join forces with Gantz. Israel needs a political upset the way that it needs oxygen. Gantz has to pick a side (Yossi Beilin, Israel Hayom) After Benny Gantz's speech, the Right can call him a leftist and the Left can call him right-wing. Voters should look at the people in the top spots in his faction and realize that they are far from the left wing. Netanyahu Hates the Opposition, Socialist or Not (Noa Osterreicher, Haaretz+) What does Bibi have to be offered to recognize the Israeli opposition? A suitcase with $1 million in unmarked bills? A flight to a country without extradition agreements? Killing a Palestinian and Investigating (Zvi Bar'el, Haaretz+) When Israeli settlers kill a Palestinian, the story isn’t the murder, but the investigation. We put on a good show, say ‘there is no basis for prosecution,’ and get it over with. Israel never stops to think (Giora Eiland, Yedioth/Ynet) One of the most pervasive problems Israel faces is that when it comes to the mechanisms of the state, from unbridled bureaucracy or ending the conflict with the Palestinians, no one ever learns from the past or plans for the future. 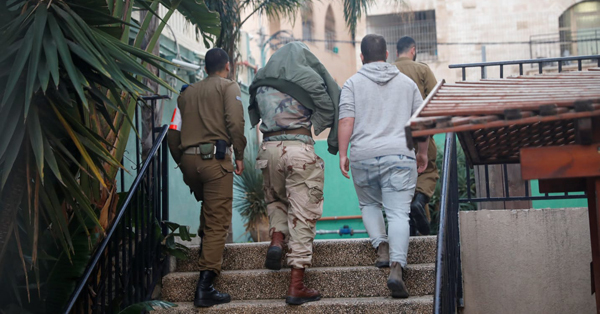 The lost art of Palestinian 'protection' (Dr. Reuven Berko, Israel Hayom) The Palestinians, it seems, have never earned a shekel that wasn't "protection money." Now, amid a swiftly changing geopolitical landscape, their traditional extortion methods have lost their effectiveness. The old-new anti-Semitism (Sever Plocker, Yedioth/Ynet) The images of neo-Nazis protesting the 'occupation of the Jews' outside Auschwitz on International Holocaust Remembrance Day indicates that populist anti-Semitism is once again rearing its ugly head. Not only among the right-wing extremists but as part of left-wing discourse as well. Based on what happened this week, the Holocaust seems to have become a tool in petty politics (Lilach Sigan, Maariv) Each person chose the part that was more appropriate for him than the report, used it, threw it out and returned to his routine. How do you identify a person who has not learned anything from the Holocaust? When he does not blame it on a political rival. Coming full circle in Hebron (Ariel Kahana, Israel Hayom) Netanyahu's announcement that he will not renew the mandate of the TIPH mission may lead to some tension with Europe but that is nothing worth losing any sleep over. Now Chad, then Mali: Why African countries are normalizing with Israel (Ramzy Baroud, Maan) It is no surprise that the governments of Chad and Mali are struggling, not only economically, but also in terms of political legitimacy as well. Torn in the global struggle for dominance between the US and China, they feel pressed to make significant choices that could make the difference between their survival or demise in future upheavals. For these countries, an alliance with Israel is a sure ticket to the Washington political club. Such membership could prove significant in terms of economic aid, political validation and, more importantly, an immunity against pesky military coups. I chose not to be ashamed (Daniel Goldberg, Israel Hayom) I grew up in a good home, served in an elite IDF combat unit, am happily married, live in Tel Aviv and work in high-tech. And I was sexually assaulted. What happened to me could happen to anyone.